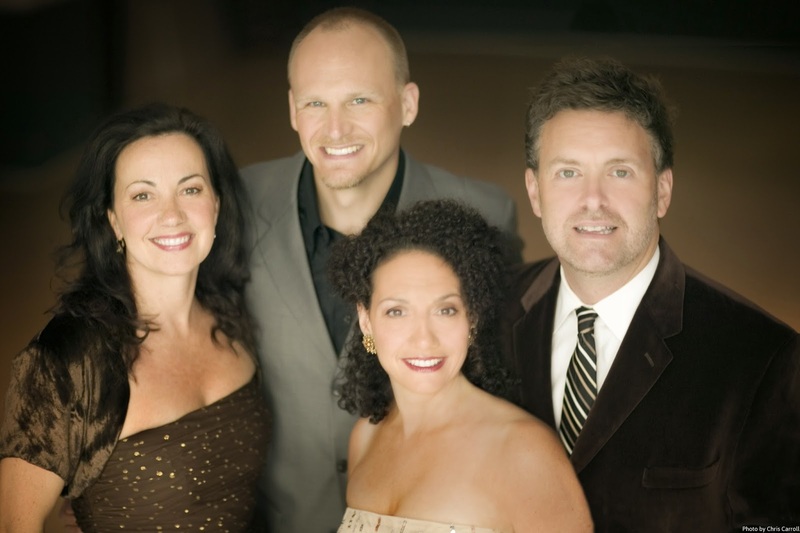 Vocal acuity and seamless harmony are the hallmarks of the Grammy Award-winning quartet New York Voices, who performs at Diana Wortham Theatre Saturday, April 11 at 8:00 p.m. Known for close-knit voicings, inspired arrangements, and unparalleled vocal blend, New York Voices has refined its musical story to a high art. The group’s deep interests rooted in jazz, Brazilian, rhythm and blues, classical, and pop offer a sumptuous mix of the traditional and the contemporary. Chameleon-like musicianship allows New York Voices to move seamlessly from setting to setting: from orchestral/big band to more intimate lineups, the consummate performers wow audiences in small and large venues alike. Formed in its current lineup in 1994, two projects they collaborated on received Grammy awards (one with the Count Basie Orchestra, the other with Paquito D’Rivera). The group continues to make numerous guest appearances and tour internationally, appearing at Carnegie Hall, Avery Fisher Hall, Kennedy Center, and more. Kim Nazarian is a co-founding member who collaborates frequently on other innovative projects. She is one of the featured voices on Bobby McFerrin’s the multi-Grammy Award nominated VOCAbuLarieS album, and she partnered with the Smithsonian Jazz Masterworks Orchestra and the Manchester Craftman’s Guild on a concert tour dedicated to the late, great Ella Fitzgerald. Peter Eldridge is also a founding member of New York Voices. He has released four solo albums, and his vocals and compositions have been featured on the albums of many others artists including Nancy Wilson and Denise Donatelli. Darmon Meader is recognized in both the jazz vocal and instrumental worlds as a highly respected vocalist, arranger, and saxophonist. He is a co-founder, musical director, chief arranger, composer, producer, saxophonist, and vocalist with New York Voices. Lauren Kinhan joined New York Voices in 1992 and has contributed many compositions to the group’s catalog. Kinhan has recorded three solo albums, most recently 2014’s Circle in a Square, which was partially funded by a successful Kickstarter campaign. New York Voice’s Asheville performance is made possible by Performance Sponsors Nancy Houha & William Hilson; and by Mainstage Music Series Sponsors Henry LaBrun, First Citizens Bank, The Omni Grove Park Inn, and Ward and Smith, P.A. ; with additional support from Media Sponsors WNC magazine, WCQS 88.1 FM, and WTZQ AM 1600.